A Michigan Bed And Breakfast ... Solitude For Lovers. A Michigan bed and breakfast is always a perfect lovers getaway or honeymoon treat. Most bed and breakfasts are older, Queen Anne style homes loaded with romantic charm and character. You get that "stepping back in time" feeling that we sometimes need in this fast paced world we live in. Pictured above the Korner Kottage B&B is one of Suttons Bay charming gems. Any Michigan B&B that I have stayed in were all operated by folks who grew up in the community. That's a big plus as you can count on reliable information when it comes to local attractions or things to do. They are proud of their establishments and communities and it shows. Most have beautiful gardens and verandas to relax in or to merely enjoy the views. Sitting on the front porch of a Michigan bed and breakfast with a cup of coffee or a cool drink ,is a great way to enjoy some leisurely time. There is a comfortable feeling of hominess, especially when waking up to the smell of fresh coffee and breakfast being prepared. In fact, it seems like special munchies and wonderful treats are available throughout the day. A romantic Michigan b&b is a wonderful choice for a special getaway. 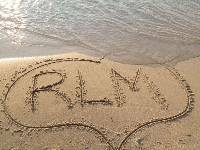 Here are some of the top Michigan bed and breakfasts located along beautiful Lake Michigan. Check back often for updates. As always tell them you found them on romantic-lake-michigan.com. 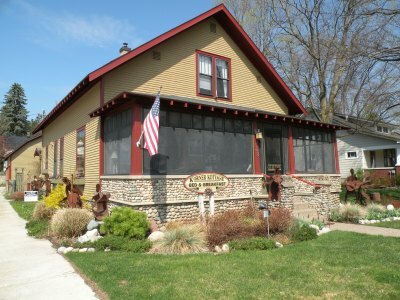 In the southwest corner along Lake Michigan in Union Pier you will find The Sandpiper Inn B&B. Inn Travelors Magazine rated it "the best bed and breakfast on the waterfront in North America". The Sandpiper Inn was also featured in Midwest Living Magazine. With nine adult only rooms, you will enjoy your own private beach and breathtaking sunsets. Contact Veronica or Jim. Located in the middle of Harbor Country® and less than a mile from sugar sand beaches you will find the Garden Grove Bed and Breakfast. Offering four beautiful guestrooms and a three room carriage house, all perfect for celebrating hooneymoons, anniversaries or other special occassions. Moving north to South Haven is Marthas Vineyard Bed and Breakfast. They offer 5 unique guestrooms with each having its own private bath, fireplace, and veranda. You can get breakfast in your room and, if you're going to spend a day at the beach, they will even pack lunch for you. Contact Lou and Ginger Adamson for more information. This bed and breakfast is just steps away from Lake Michigan beaches and fun. You'll find the perfect blend of modern amenities mixed with old fashion charm. The Wickwood Inn in Saugatuck is well known! Visit the charming Wickwood Inn. You'll find Stonewall Inn B&B in Frankfort Michigan. Listed on the National register of historic places they have 4 amazingly historic rooms and a 1 bedroom cottage. This was the first home built in Benzie county in 1860 and has remained almost unaltered in appearance. It is known as a Civil War bed and breakfast. Wake up to the aroma of a full country breakfast at this 1868 bed and breakfast. Each of the 6 rooms has its own private bath. Bicycles are available to explore scenic Pentwater. Open from May 1st to November 1st, call ahead to get a reservation. From Michigan Bed and Breakfast back to home page.